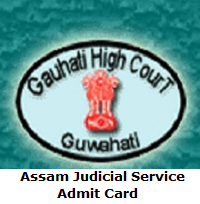 Assam Judicial Service Admit Card 2019: The Gauhati High Court officials will issue the Assam Judicial Service Grade I & III Admit Card 2019 through online at the official web portal. Candidates who had completed the application process successfully, they only eligible to download the Assam Judicial Service Grade III & I Hall Ticket 2019. The board officers are going to conduct the Assam Judicial Service Grade III Preliminary Examination on 27th April 2019 and Grade I Preliminary Examination on 5th May 2019. For this purpose, the management issued the Assam Judicial Service Admit Card 2019 in the month of April 2019. For downloading the Assam Judicial Service Hall Ticket 2019, candidates need to enter Roll Number and Date of Birth. To make easy for the candidates at the below of this page we have given a link to download Assam Judicial Service Grade III & I Admit Card 2019. Assam Judicial Service Admit Card 2019 is available soon to download. Many of the department is announcing the admit card release date before 10 to 15 days before the examination date. In the same process, this organization also released at the same time. Candidates who will appear in the exam have to download the admit card or hall ticket before one week to the exam. Firstly, the applicants need to write the preliminary exam the qualified candidates in the prelims exam only eligible for the main exam. After the prelims exam, the result date and main exam date will update soon on our website Sarkari Recruitment. Candidates can also check the All India Exams Admit Cards for various examinations on our website. The additional details about the Assam JS Admit Card 2019 check this page thoroughly. Applicants can download the admit card from the given download link at the end of this article or from the organization website of Gauhati High Court i.e.,www.ghconline.gov.in. After download of the Assam Judicial Service Exam Admit Card 2019 or hall ticket candidates have to verify it if there are any mistakes in admit card immediately inform the organization and rectify the errors. Candidates should not neglect the misprints in the admit card or hall ticket if neglected the mistakes then will face the problems in the examination center. For more information about the Assam Judicial Service recruitment process check the official notification. The selection process of the Gauhati High Court is initially the organization conducts the preliminary exam. After the preliminary exam, the qualified candidates in this test need to go through the main exam. The selected people in these two exams have to attend the viva-voce/interview process. Check the official notification for more selection process details. Admit Card or hall ticket plays a vital role in any examination process like board or competitive. The Assam Judicial Service Admit Card 2019 carries the data about the participant and exam-like participant name, roll number, category, date and time of the exam, venue of the examination center, etc. Candidates must carry the admit card or call letter along with the documental proof like Adadhar Card, Photograph, etc. for the security reason at the examination hall. Applicants who will participate in the exam must carry the admit card or hall ticket. The examination board will not enter the applicants to the examination center after the exam time. So every aspirant has to attend the exam center before twenty minutes for the exam. The candidates have to look at the back of the admit card before writing the exam and follow the instructions. We have provided the more information about the Assam Judicial Service Grade III position examination like the information on Assam Judicial Service Call Letter essential documents for the Judicial Service Grade III exam, steps to download the hall ticket. Hall Ticket is the crucial document for any examination process. By using the admit card the department can easily find out the bogus members in the examination hall because it contains the details about the contender and exam. The candidates who will not carry will not allow writing the exam. Every candidate needs to carry a documental proof from the given list along with the admit card for the security purpose at the exam center. Aspirants can follow the below process to download the admit card from the official website without any errors. Visit the official website of Gauhati High Court www.ghconline.gov.in. Search for the Assam Judicial Service Grade I & III Admit Card. Click on the Assam Judicial Service Hall Ticket download link. Assam Judicial Service Grade I & III Hall Ticket 2019 will be shown on the screen. Submit Admit Card at the examination center with an identity. We provided the information about the Assam Judicial Service Admit Card 2019 in the above page hope it will be helpful for the contenders who had applied for the Assam Judicial Service Grade III & I Posts. If candidates have any queries on this article, then leave a comment on below comment box. For more updates like Recruitment, Syllabus, Answer key’s, Previous Papers, Result, etc. follow our website Sarkari Recruitment. Applicants can also see the examination results in Sarkari Result. Thank you.